ROBO-ONE 20th sponsored by ROBO-ONE Committee, took place at Institute of Industrial Promotion Kawasaki Hall in Kawasaki City on Mar 24-25th, 2012. In ROBO-ONE 20th, ROBO-ONE Light 4th took place on Mar 24th, 9 m Footrace took place as the preliminary ROBO-ONE tournament (Light Class, Under 3kg) on Mar 24th and the main event ROBO-ONE 20th tournament (Light Class, Under 3kg) took place on Mar 25th. ROBO-ONE Light is robot fight tournament for robots on the market, which are officially recognized by ROBO-ONE Committee. Beginner, who gets robot from the market and want to attend the ROBO-ONE Tournament, also can attend the competition with his robot which is made from just robot kit. 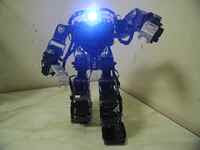 Custom-built robot, just the weight 1 kg or under also can attend the tournament. The winner of Light Class gets the right to attend the 20th ROBO-ONE tournament on the next day. Robots on the market, officially recognized by ROBO-ONE Committee, can attend the competition whether the robot adapt ROBO-ONE 20th regulation nor not. Remodeling is prohibited. Head parts can be remodeled and also covering robot body with plastic or paper is permitted. 2) Robot weight except for the officially recognized robot is 1 kg or under and the robot has to adapt ROBO-ONE 20th regulation. In the tournament, custom-built robots handicapped by about 500 g compared with officially recognized kits such as KHR-3HV. It was interesting that how builder of custom robot 1 kg or under overcame the weight handicap and which robot kit was able to win the tournament. However, it is necessary for getting championship of robot fight tournament to carry 3 important factors such as good body, good motion and good control. Thirty-four robots joined the tournament. They were 2 KHR-2HVs, 12 KHR-3HVs including ROBO-ONE Custom, 2 ISAMARO, 8 TINNYWAVEs from KOREA and 10 custom-built robots 1kg or under. RONO-ONE Light 4th tournament was carried out divided four blocks, all blocks winners were TINYWAVE from KOREA. 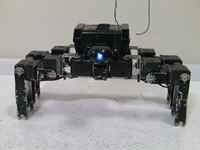 Custom-built UK1 robot could overcome the weight handicap 500g. The Champion was ROBOROBO5 (TINYWAVE), the 2nd place was ROBOROBO4 (TINYWAVE) and the 3rd place was ROBOROBO1 (TINYWAVE). The results are here. The 2nd Stage, ROBOROBO4(TINYWAVE) vs Albero(UK1). The winner was ROBOROBO4. The 2nd Stage, ROBOROBO5(TINYWAVE) vs Hiten(UK1). The winner was ROBOROBO5. The 2nd Stage, ARUENSHI2(TINYWAVE) vs Banboo(KHR-3HV). The winner was ARUENSHI2. For the 3rd Place match: ROBOROBO1(TINYWAVE) vs ALUENCHI1(TINYWAVE); The 3rd Place was ROBOROBO1. Final Match: ROBOROBO4(TINYWAVE) vs ROBOROBO5(TINYWAVE), ROBO-ONE Light 4th champion was ROBOROBO5. ROBO-ONE Light 1st took place at the same place on Mar 20th, 2010, ROBO-ONE Light 2nd on May 22nd, 2010 and ROBO-ONE Light 3rd on Oct 8th, 2011.